Feel bored with the ordinary chess set? Bored with those standard chess in brown and black? To make you feel enjoy to play chess and get new sense in the game, here we present different color of chess set. 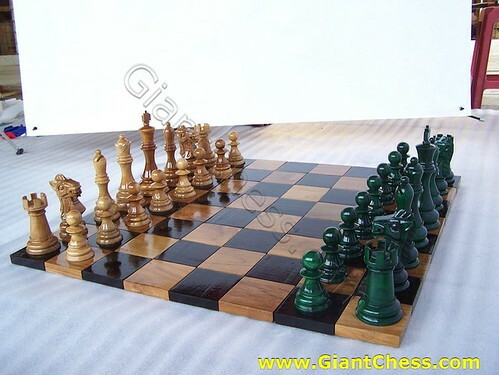 We give you brown vs green chess set and completed with brown and black squares of wood chess board. They looks so elegant and harmonious. You can use it for your own collection or outdoor decor at your garden. Visit our website. You will find another color that so attractive and unique. If you see the picture carefully, you will found the different design of this chess compare with another chess. It because we try to add unique touch to our product and make it so different that has its own characteristic. Find also other design of chess in our factory with variety color and sizes. All of our product are made of Teak wood, so those are very durable for outdoor and indoor need.